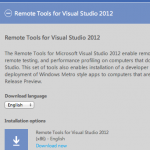 First, go to http://www.microsoft.com/visualstudio/eng/downloads and scroll down to Remote Tools for Visual Studio 2012 and install the tool on your tablet. Choose ARM if you have an ARM device of course. Install the tool on your tablet and in your start page’s All apps view (via bottom application bar), you will have an app called Remote Debugger Configuration Wizard. Run it to open the wizard and input your admin user’s credentials (most likely in the form of [MachineName]\[UserName]). Once it’s set up, you can monitor the remote processes with the Remote Debugger tool. Then, from your desktop with the code, select to run from Remote Machine. In the pop-up, input the machine name / IP of the tablet and it port and voila, you should have the debugger and app running on the tablet! You may have to run the Remote Debugger tool on new boot to start the service.